Posted on July 20, 2017 at 12:06 pm. 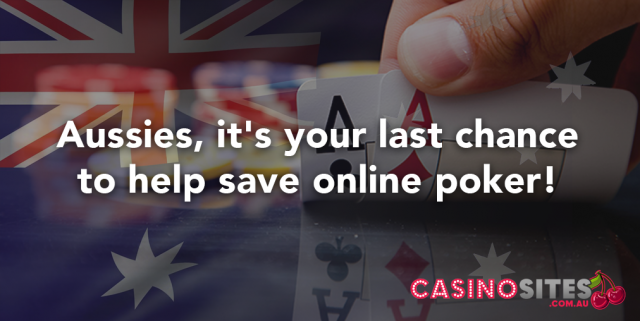 Australians who want online poker to have a chance at survival need to get typing today, because the deadline to have your voices heard ends tomorrow. The Australian government is holding a Senate Inquiry into the future of online poker later this year, and the Australian Online Poker Alliance (AOPA) is calling on the Aussie poker community to write and submit their desire for regulated online poker to remain a legal pastime in our country by July 21. The Inquiry will likely happen before the House and Senate come to an agreement over the amendments in the IGA Bill 2016, which will prohibit all online poker in Australia. AOPA founder Joseph Del Duca has personally called on all Aussie online poker players to get their submissions in fast, on a PokerStars sponsored contribution post published last week. Mr Del Duca has made it incredibly simple for everyone interested in saving online poker in Australia to get their opinions heard, encouraging those unsure of how or what to write to use his pre-written statement summarising the AOPA’s hopes for a continuing and thriving Internet poker community in our country. “I want regulated online poker in Australia. All banning online poker does is ensure that reputable operators will no longer operate in Australia and replaces them with those that purposefully act outside of Australian law. The Alliance has also listed several helpful talking points for all Aussie poker players to use in their submissions on the official AOPA website. The AOPA has had significant support in the months leading to the Inquiry. Liberal Democrats senator David Leyonhjelm, who has been an active and vocal participant in the fight to exempt online poker from the looming IGA amendments, has shared the inquiry on Twitter. Six-time WSOP winner Daniel Negreanu has also shown his support from across the pond, re-tweeting the AOPA’s message to his 439,000 followers on Twitter. Come on Aussie poker lovers, you have no excuse – get on board and visit the Inquiry’s page on the official Parliament of Australia website, leave your name and contact details and get your concerns and opinions and voice heard. In November last year, the Australian Government officially introduced the Interactive Gambling Amendment Bill 2016 into the House of Representatives. The bill is a direct result of the 2015 O’Farrell Review into Illegal Offshore Wagering, which proposes changes to the current Interactive Gambling Act 2001. The amendments to the bill will ban all offshore online casinos and poker rooms from servicing Australian players. The Australian Senate voted against exempting online poker from the amendments following the third reading held on March 21, despite Senator Leyonhjelm’s commendable fight, and passed the Interactive Gambling Amendment Bill 2016 to move to a vote in the House of Representatives. According to our government, the IGA always intended to ban all forms of online poker and online casinos. However, it never effectively prevented offshore licensed poker sites conducting business here, creating a gray market for international powerhouses like 888Poker, Full Tilt and PokerStars to service Australians while paying no local taxes. The government describe their amendments efforts as a “Crack down on illegal offshore gambling providers”, and that the O’Farrell review’s reported $64 million and $400 million wagered at “illegal” offshore providers resulted in “lost revenue” and “weaker consumer protection”. The problem is the Australian government has seemingly hand-waved or minimised the hard work of internationally recognised gaming authorities such as the Malta Gaming Authority and the United Kingdom Gambling Commission, which provide legitimate and world-class licensing and regulation of these supposed “illegal” offshore online poker sites and have effectively kept Aussie players secure all these years. Currently, Australians can still legally play at several offshore online poker sites licensed by these advanced gaming jurisdictions, such as Party Poker and PokerStars, the latter of which seems to be holding out their withdrawal from Australia as long as possible. PokerStars is licensed by the Malta Gaming Authority, which is one of the world’s leading and most trusted jurisdictions for online gambling. Other major online poker brands, such as 888Poker, have already exited the Australian market in preparation of the IGA amendments. What will happen if the new IGA amendments ban online poker? As the AOPA have concisely summarised in their blog post, Australians will see properly regulated and safeguarded online poker options withdraw their services from the country. Pro Australian poker players like Jackie Glazier, who have sponsorship deals with offshore poker sites like partypoker to represent the Australian market, will possibly be dropped, or otherwise face complications they don’t need. Instead of playing at world-class poker sites like PokerStars, Aussies will just have to settle and play live games, or face the risk of playing at dodgy unlicensed offshore poker operators who don’t care about the Interactive Gambling Act. Sure, certain unlicensed offshore sites like America’s Cardroom, which have been servicing US online poker players for years (who also are still battling their own equally restrictive laws on online gaming) may be trusted enough by thousands of other poker players overseas, but if something goes wrong, there’s no regulatory licensing body to turn to for appeals. “It will promote the black market. There are ways to circumvent these prohibition approaches. People will gamble using foreign providers by various means. They will be in the hands of sometimes shady providers, and if they get ripped off, they will have no recourse,” Senator Leyonhjelm previously told the Huffington Post Australia earlier this year. Unfortunately we completely agree and envision this scenario playing out, but it is a situation that we don’t want to see happen. Get your submissions into the Australian online poker inquiry, by the end of today and give online poker a fighting chance in Australia. Not all poker sites accept players from United States, but thankfully there are online casinos with real money poker games available to players from United States. We highly recommend Bovada Casino as safest and the best online casino providing support for players from United States, with a great selection of poker variants to choose from.